Description: This Divya Desam is situated in Uraiyur, the ancient Chozha capital, now a part of Thiruchirappalli; the Shivastalam enshrining Panchavarneswarar is also located in Uraiyur. Thirukkozhi is the birthplace Thiruppaanazhwar the author of Amalanadipiran (the celebrated paasuram describing the glory of the image of Ranganathar, at Srirangam). Deities: Azhagiya Manavalar (in a standing posture) facing north, with his consort Kamalavalli in the same sanctum in a seated posture are the presiding deities here. There is no festival image for Perumaal here. The festival image of Ranganathar is brought in procession from Srirangam to commemorate his marriage with Senkamalavalli. Legends: A valiant rooster, believed to have warded off an elephant with its beak, here at Uraiyur; the name Thirukkozhi (Mookkeeswaram) possibly stems from this legend. Kamalavalli Naachiyaar, daughter of the local Chozha King is said to have meditated upon Vishnu, and married him here after which the Chozha King built this temple, with its door facing North towards Srirangam. Festivals: In the month of Pankuni, the image of Ranganathar from Srirangam is brought in procession to this temple and a grand Kalyana Utsavam is celebrated on the day preceding Pankuni Uthiram. 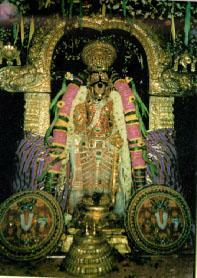 Shown above, is the festival image of NamPerumaal of Srirangam. The Thiruppanazhwar festival is held in the month of Kartikai.